This sequence was christened the Fibonacci sequence by Eduard Lucas in 1877 when he used both it and what we call the Lucas sequence (which is constructed in the same manner as the Fibonacci sequence, only its first two terms are 1, 3, so the sequence starts 1, 3, 4, 7, 11, 18, ...) to search for Mersenne primes. Both the Fibonacci sequence and the Lucas sequence can be produced by using the rule that each term is the sum of the two previous terms. The next few terms in the Fibonacci sequence after the ones listed above are 377, 610, 987, 1597, 2584, ... .
, the Golden Ratio. For example, 2584⁄1597 = 1.618033813..., which gives the Golden Ratio to six decimal places. In 1948, Charles Raine was able to connect Fibonacci numbers to Pythagorean triangles. Take any 4 consecutive Fibonacci numbers; the product of the outer terms and twice the product of the inner terms are the legs of a Pythagorean triangle, and the hypotenuse will be a Fibonacci number. The area of the triangle will be the product of the original four numbers. There are many other mathematical properties of this sequence. For example, every prime number divides an infinite number of terms of the sequence. Also, if the nth Fibonacci number is prime, then n itself is prime (except for F4 = 3). The converse is not necessarily true though. 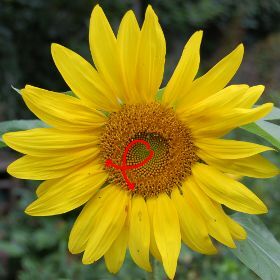 A sunflower, with the direction of clockwise and counter-clockwise florets drawn in red. The Fibonacci sequence and the Golden Ratio can, surprisingly, be found in nature, being connected with plant growth. For example, Fibonacci numbers often appear in the scales of a fir cone or in the florets of a sunflower. A sunflower usually has two sets of spiral rows with the number of florets (which become seeds) in both sets being a Fibonacci number, For example, 21 and 34 or 89 and 144. Many flowers, such as the one pictured below, have a number of petals equal to a Fibonacci number. There are many more Fibonacci numbers to be found in nature if you look. 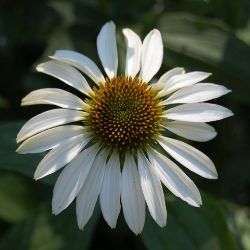 This Echinacea flower has 21 petals, and its florets are arranged in rows containing 21 and 13 florets. Last updated February 20, 2017.